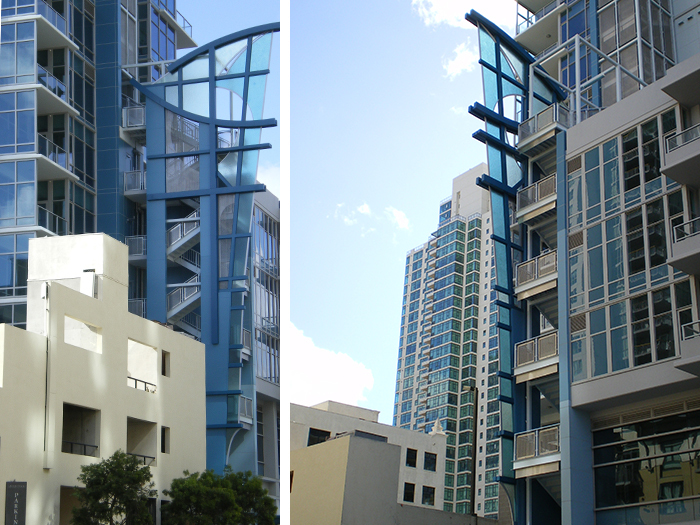 In addition to the ten mosaic Sapphire Tower Columns, Betsy Schulz designed a metal and glass “fin” structure to adorn the Sapphire Tower residential condominium, much as jewelry might adorn a person, with the glass in the sculpture representing the gems, and the metal framing acting as the setting. Designed and built during the building’s construction, the angular sapphire-blue sculpture complements the building’s lines. The 80-foot-tall sculpture was designed to be integrated into the building, both for support and to allow for a large size within a small footprint. Subtle gradations of color on the walls of the stairs behind the sculpture coordinate with and are visible through the sculpture itself. LED strips light the building at night. Centurion Partners, AVRP Studios, San Diego Historical Society, Barona Band of Mission Indians, Sycuan Band of the Kumeyaay Nation, Kathryn Schmiedeberg, Katie Pelisek, Insu Nuzzi, and Kathy Tanaka.